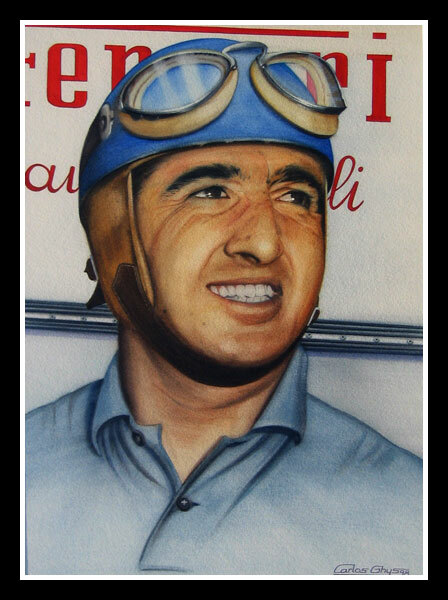 Alberto Ascari was the fastest starter of all. This highly superstitious man is regarded by many as one of the greatest drivers of all time, and indeed Fangio announced after Ascari's death: "I've lost my greatest opponent." Ascari was born on 13 July 1918 in Milan, the son of one of Italy's most successful drivers. Ascari acquired father Antonio's speed as well as a double-edged personality: a calm and confident-looking exterior hiding a dark inner temperament. This was not all he shared with his father, for they both died at the wheel of a car aged 36 and on the 26th day of the month. Despite the dead of his father, Alberto became a works rider for the Italian motor cycle team, Bianchi. Although he was very successful on two wheels, he harboured a deep passion for cars, and in 1940 Ascari approached Enzo Ferrari and became one of the first two drivers to race a Ferrari. In 1950 the first world championship took place with Ascari driving for Ferrari. He could have been the first man to win a Grand Prix for the Italian team, but showed his team spirit by declining to take over Froilan Gonzalez's car, leaving the Argentinean to score that first Grand Prix win. Ascari's decision to turn down his team leader's right also cost him the championship itself, but in 1952 and 1953 under two-litre F2 regulations Ascari became world champion in a Ferrari 500. In 1955 he survived one of the most famous accidents in motor racing history. Little knowing that he was about to take the lead - as Moss has just retired from the race - his car plugged into Monaco's harbour. Ascari was taken to hospital with a broken nose, but discharged himself in order to drive a Ferrari 750 sports car four days later. After a few laps in the car, Ascari crashed inexplicably and was killed instantly. Previously, he had confided with Fangio at Monaco, "My game is going wrong - the star is setting."